The Book of Em: the Last Gatekeeper is a rousing fantasy tale. 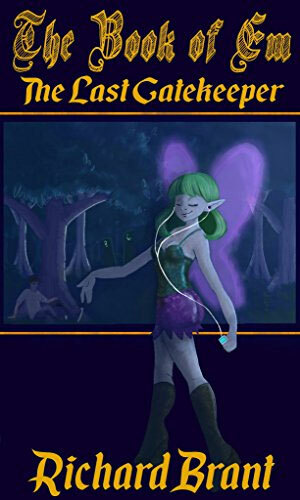 Fifteen-year-old Ben runs into the woods from his abusive home and finds a fantastic world of fairies and goblins. He becomes the Last Gatekeeper in the title, and is the only one who can save this wondrous world. The plot is a familiar one, a wandering romp of a coming of age tale in a fantasy world. Strange allies, stranger enemies, teenage problems…the male and female protagonist have both in spades. There's nothing particularly original here, but it's fun. The author opted to go with traditional creatures of fantasy and traditional sorts of names, instead of the difficult to pronounce or remember names and beings you see in a lot of similar books. Sprinkled throughout the novel are illustrations of characters and scenes, done well and never distracting. They could stand to be cleaned up digitally a bit, but there is a charm to their sketchbook style. The writing fits for a book aimed at kids in their mid-teens (the age of the protagonists). Ben lapses into the 'this is impossible' cliché at the beginning and there is some juvenile cursing, the kind you get from teens who have just learned how to cuss. There are a lot of mature themes, including abuse, alcoholism, drugs, and missing parents. This is a lighter novel, but it isn't very fluffy. These challenges are met with courage and honor, however, and are never dwelled on or presented as positive in any way. The Book of Em is set up to be the first of a series, with a prophecy to fulfill and at least one world yet to be quite saved. The second novel, The Book of Em: A Dragon's Tears, is being written. If you're looking for a light but still intense read about a coming-of-age or two, pick it up. "Speed isn't everything. She spotted her destination in the distance. My wings get me there fast enough. Fast enough was a big of an understatement." Richard Brant is a native born Canadian. Before embarking on his writing career, he worked in the (mind bogglingly boring) high tech world as a Configuration Manager/Business Analyst. Prior to that, he spent ten years as a counsellor in group homes for the disabled, mentally challenged, and emotionally disturbed youths. His loves, you might ask? Then again, you might not. I don't think he'd blame you if you didn't. His dogs, his cat, his son, club music, literature (of course), and old classic black and white movies. Other than that, Mr. Brant's life is his writing, and his writing his life. There's not a day that goes by he does not give his head a shake at the fact people actually read his books. His preferred genres (after several disastrous attempts at others) are Science Fiction and Fantasy. There is nothing Mr. Brant enjoys more than writing, with the possible exception of his son. The ability to create a world from the grey matter between his ears is as close, he thinks at least, as he will ever come to divinity, and for that he will always be grateful. Two quote Mr. Brant: I don't want to be famous. I just want to be in Wikipedia.